Stop Blaming Cats for Bad Driving! 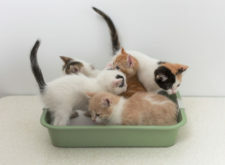 Most of us have heard of Toxoplasma gondii, a protozoan parasite, because of its connection with cats, cat litter and birth defects. Pregnant women are warned to avoid changing cat litter lest they inhale this parasite from the dust (T. gondii only reproduces sexually in cats). And an infection during pregnancy can cause serious birth defects, such as hydrocephalus. But what about the rest of us — do we need to be concerned about this parasite? Maybe we do, if some research from the University of California, Riverside is substantiated. Dr. Clément N. David and colleagues explain that T. gondii can infect virtually all mammals, and infects about one-third of the world's human population — it's a chronic infection. It exists in the brain as inactive cysts which are kept in check by macrophages (part of the immune system). If the immune system is not normally active, the cysts can cause an active infection. Toxoplasma infection, they state, "has been suggested to be a significant risk factor in Parkinson’s, Alzheimer’s, mania and schizophrenia and is correlated with specific changes in murine and human behavior." They suggest that the mechanism by which these changes occur is the dysregulation of glutamate, a major neurotransmitter in the central nervous system. A particular type of brain cell, the star-shaped astrocyte, is multi-functional. For example, in the brain astrocytes secrete glutamate, and help maintain the blood-brain barrier. Their function with respect to glutamate involves adjusting the uptake and release of glutamate, as well as its conversion into glutamine. Previous observations of such cells during T. gondii infection have suggested that their physiology may be altered as a result of infection — in particular there seems to be an increased level of glutamate in the extracellular space in the brain. And such elevated glutamate levels have been associated with neurodegenerative diseases such as amyotrophic lateral sclerosis (ALS), multiple sclerosis (MS), and Alzheimer's disease. These researchers used mice infected with T. gondii to further investigate the association of this infection with brain abnormalities. They found that three weeks post infection, astrocytes in various brain regions were significantly swollen — and this swelling was still present 6- and 12-weeks post infection. Such swelling suggests alterations in astrocyte physiology as well as morphology, and indeed they found that the levels of extracellular glutamate were increased during the infection. Such increases were first seen about 4-weeks post-infection, and continued to increase thereafter. Further, abnormalities in the neurons associated with the astrocytes were also noted. Treatment of infected mice with the antibiotic ceftriaxone, it was found, seemed to prevent T. gondii-induced glutamate dysregulation. The investigators also examined the effect of infection and ceftriaxone treatment on mouse behavior. They found that infection significantly decreased anxiety-linked behavior in a maze, but a week of antibiotic treatment did not return that activity to levels seen in uninfected mice. "These data suggest that although infected mice are outwardly indistinguishable from their naïve counterparts, chronic CNS pathology is present," the authors stated. "The finding that chronic Toxoplasma infection in the brain induces significant disruption of neurotransmitters may support the theory that such an infection could trigger neurological disease in those already genetically predisposed." Whether or not such changes initiated by T. gondii are causally linked to neurodegenerative conditions in humans certainly remains unknown. In addition, it will be important to know if other types of chronic brain infections have similar effects on brain function.